Some brand new set photos and the first set video from Glass, aka Split 2, have arrived online. M. Night Shyamalan managed to get himself out of director's jail with this year's Split, which turned out to be a secret sequel to his second movie, Unbreakable. Now, he's hard at work filming the follow-up, officially titled Glass, which will complete the director's unconventional superhero trilogy. Now, thanks to a new set video, we have our first look at a showdown between Bruce Willis and James McAvoy in the movie. In the video, we see Bruce Willis' David Dunn pinning James McAvoy's Beast against a van. Things get ugly when the two start exchanging blows. It's not really a boxing match, but it looks really intense. We haven't seen David Dunn for years, so it's possible his powers have increased since Unbreakable. And we know from Split that The Beast is a very formidable opponent. 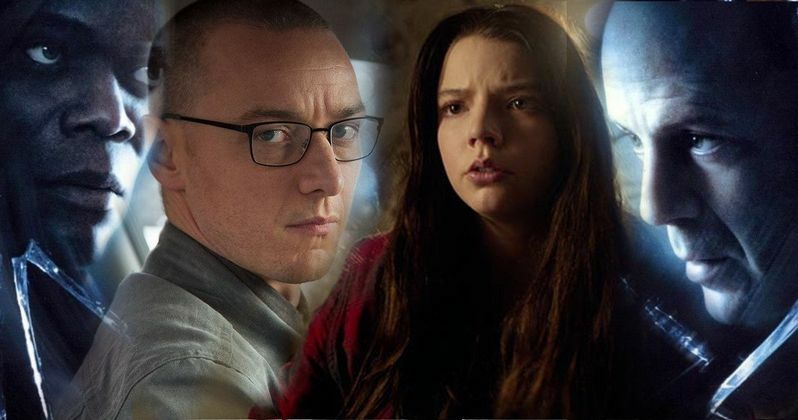 Glass picks up following the conclusion of Split and finds David Dunn (Bruce Willis) pursuing Kevin Wendell Crumb (James McAvoy), aka The Beast, in a series of escalating encounters. Like the one that we see here in this set video. While this is going on, the shadowy presence of Elijah Price (Samuel L. Jackson), aka Mr. Glass, emerges as an orchestrator who holds secrets critical to both men. The end of Split saw David Dunn at a coffee shop watching a news report about the events that transpired, connecting the world's of Split and Unbreakable together. Glass looks to take that one step further, which is an exciting prospect. In addition to the set video, quite a few set photos from Glass have made their way online as well. We have a new shot of Samuel L. Jackson's Mr. Glass. There's also a shot of Bruce Willis not covered by a raincoat, as well as a look at Anya Taylor Joy, who reprises her role from Split in the sequel. There's also a shot of James McAvoy walking around shirtless, just as he's seen in the fight depicted in the video. Some of the shots aren't of the greatest quality, as is often the case with these set photos, but they're likely enough to get fans excited for the conclusion of the Unbreakable trilogy. Even though M. Night Shyamalan is busy filming the sequel right now, it's not scheduled to hit theaters until January 18, 2019. So we've still got to wait a while before actually getting to see this showdown in its finished form. Considering that Split enjoyed such success at the box office ($276.9 million worldwide) with a January release, it seems like Blumhouse wants to employ the same strategy with Split 2/Unbreakable 2. Be sure to check out the Glass set video, courtesy of Daily Mail, as well as the new set photos, for yourself below.